Throughout the year the Brisbane Lions AFL & AFLW players will conduct visit to Football Clubs and Community Groups across Brisbane, Sunshine Coast, Wide Bay and Darling Down regions as well as hosting events in Melbourne for our Victorian fans. Visits to your local club will be communicated through your clubs committee and times arranged for players to come out and help with training and events. Please contact our Community Team at community@lions.com.au to discuss a club visit. 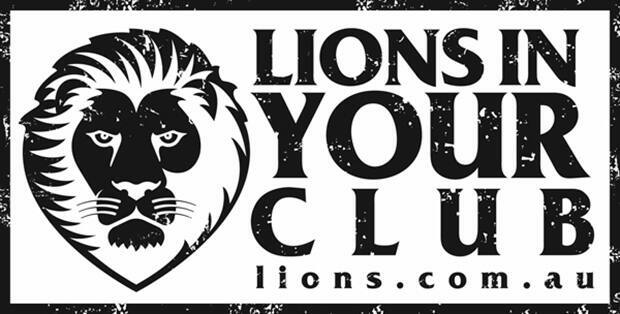 We’d love to see photos of the players at your club, please use the handle @brisbanelions and #LIYC when posting on social media to feature on our website. 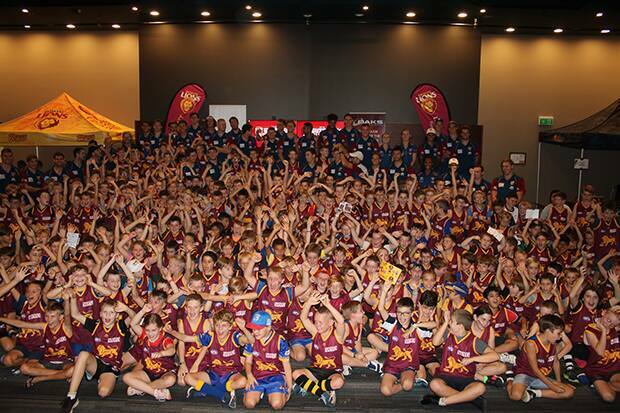 The Brisbane Lions are committed to supporting volunteers of all levels. 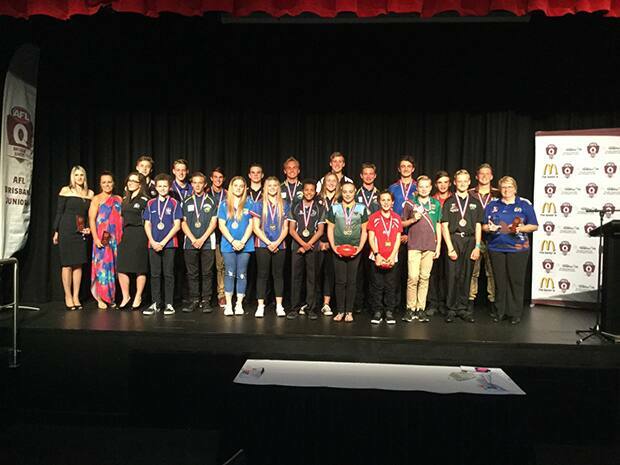 Through our partnership with AFL Queensland we annually award a “Junior Football Volunteer of the Year”. Each year the club recognises over 150 nominees from Junior Football Clubs with a unique game day experience to thank them for the tireless efforts they put into grassroots football each year. To nominate a worthy volunteer please contact your local club president to find out when nominations are open. 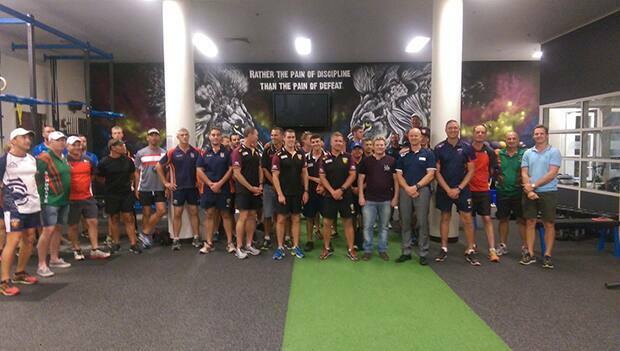 In consultation with AFL Queensland the Brisbane Lions initiated our first Community Club Masterclass in 2017. This masterclass evening is designed to support Community Football Volunteers and their committees to learn from those working in a professional sporting club to improve their own club. Staff from each area worked closely in intimate discussion groups to get to know each club and their individual needs and challenges to provide advice and guidance to how they could improve and streamline their operations. The coaches at the Brisbane Lions come from a wide range of backgrounds and experience, from our AFL and AFLW teams to the Hyundai Help for Kids Brisbane Lions Academy our coaching staff have a wealth of knowledge in not only football but in people management, leadership, culture, education and numerous other areas. Coaching is an artform and encompasses a wide skillset, whilst the majority of community coaches are volunteers they share a unique passion to develop their players and desire the help the succeed as individuals and as a team. It’s for this reason our coaching staff conduct a number of masterclass sessions across the year along with visiting individual clubs to teach coaches and take training sessions where possible. The Brisbane Lions are excited to form a part of the AFL Queensland participation pathway with the launch of Roy’s Junior Footy. This program has been piloted by AFL Queensland to provide a transition pathway between NAB AFL Auskick and Junior Club Football. Having a modified program to safely teach the skills of the game along with modified match play sees boys & girls developing their football ability so they are ready to be a part of our AFL & AFLW teams in the future. 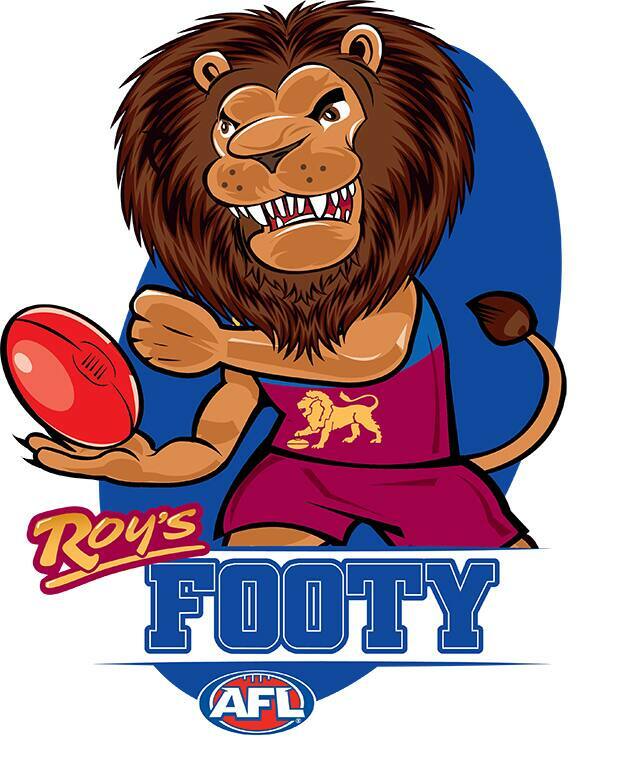 Roy’s Junior Footy is hosted at Junior Community Clubs in Queensland, games are held on Saturday mornings and in local clusters. Having small sided teams helps to ensure the game is fun, the travel is minimal and the “competition” is continually changing and entertaining. As a connection with the broader football community, the Brisbane Lions will continue to supply ticketing offers to all levels of Community Football. These offers are designed to engage participants, parents, coaches and volunteers at different levels and are communicated directly with club by the club and AFL Queensland. A brief overview is below of the different offers, please contact your local club for more specific details. Getting your first Lions guernsey is a special moment, it’s something that every Lions player cherishes across their career and as part of our commitment to Junior Football Under 9 players are presented with a unique Brisbane Lions Guernsey each year. This initiative is designed to encourage more Queenslanders to continue to adopt the Brisbane Lions as their team. Lions CEO Greg Swann said the incentive would help encourage Queenslanders to follow and play AFL, as well as giving something back to the footy community. “We see this as one way of helping to give back to our local grassroots footy community,” said Swann. “The support we get from local footy clubs is just incredible and goes a long way to helping spread the word on our great sport across the region. AFL Queensland Chief Executive Dean Warren said: “Junior AFL football is sequentially modified from under 8 to 11 age groups to provide a fun, safe and quality match day experience and environment for all participants, this initiative will help connect our junior players (the stars of the future) with the Brisbane Lions and their players. In 2018, AFL Queensland registered players from across the Brisbane Lions Zone born in 2010 will be eligible to receive this offer. Further details will be communicated shortly, but to ensure you don’t miss out sign up to play Junior Football in 2018 now at play.afl. 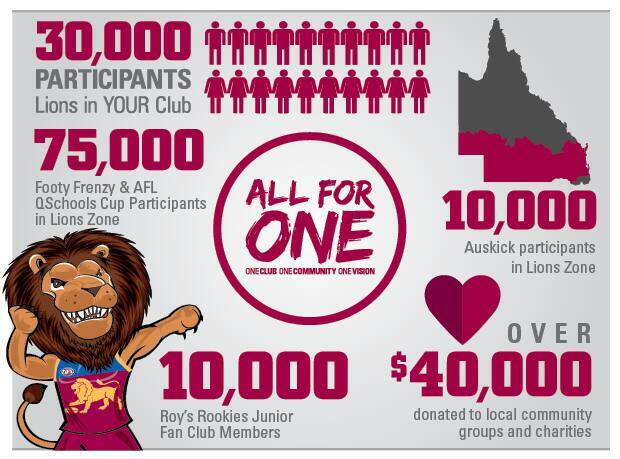 The Brisbane Lions Zone incorporates close to 100 Junior and Senior Community Clubs as part of the Club’s way to give back we supply avenues to assist clubs in raising funds to support their own Clubs growth and success.